This traditional quilt features crows, stars, pinwheels, and shirting prints. Fabrics in the quilt shown are from the Farmhouse Blues 2 collection by Windham Fabrics. Melissa Peda is a blogger, pattern designer, seamstress, quilter, and crafter. She strives to encourage and inspire others to add creativity and color to their lives. For more about Melissa, her creative process and projects, visit her blog at 100billionstars.blogspot.com. 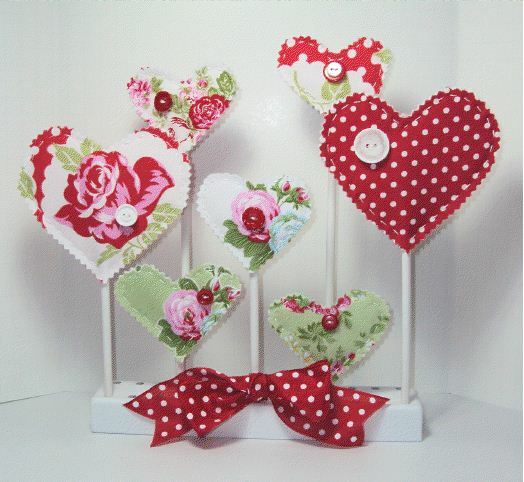 Quilted hearts and a ribbon bow say “Love is in the Air”. This simple craft project is a great way to express your favorite fabric loves. The hearts are not permanently affixed to the dowels which allows you to be as fickle as you please. Mix and match fabrics front and back for maximum fun.